From Moms to Grandmas: Jeepers! It's January! Welcome to the Jeepers It's January! 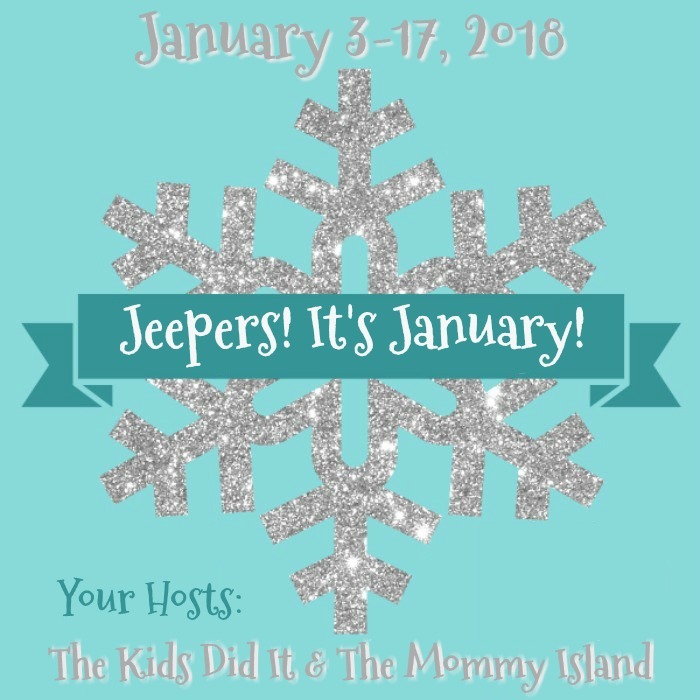 Giveaway Event hosted by The Kids Did It and The Mommy Island ! After entering my giveaway you will see many great blogs with prizes. We were involved in many awesome giveaways this fall and will continue to. Feel free to check out our Giveaway Page as they change often. Why not enter to win some nice prizes while your curled up by the fire staying warm? Good Luck to Everyone! Mom To Grandma is self sponsoring this one and we want to give one lucky winner $10. in Pay Pal Cash! Must be 18, World Wide! Winner must return winning e-mail within 48 hours or a new winner will be drawn. Please give the RC a moment to load. While any one entry will enter you, the more tasks you complete, the higher your chances. Ends 1/17/18 11:59pm. Good Luck Everyone! I like a light snow but not ice just enought to make it look pretty! Oh boy...favorite part of winter? Being inside where it is warm. It is so cold in Michigan! i like all the school breaks, love spending more time with my kids! i heard this contest on a blog hop page! My favorite part of winter is going cross country skiing! I found this giveaway via a link in the giveaway hop. I am not a big fan of Winter, I don't like the cold or driving in the snow. But the snow can be pretty to look at. My favorite part of winter is skiing, found this giveaway from icefairy's Treasure Chest . My favorite part of winter is when it gets cold, and I found this giveaway through the Jeepers! It's January! blog hop. My favorite part of Winter is sledding with my kids. I found this giveaway following the Jeepers It's January hop. My favorite part is the snowy landscapes. I found the giveaway in your email update. Thanks and happy new year! I love watching the snow fall in the winter and I found this contest hop through an email. My favorite part of winter is the snow! I found this giveaway with my email subscription. I'm not sure why my comment isn't showing up, but I hope this comment counts. Happy New Year! My favorite part of winter is sitting by the fireplace reading. I found the giveaway in an email from you (I'm a subscriber). I love snow and drink lots of hot chocolates. I found this giveaway on the blog Litterary Winner. my favorite part of winter is playing in the snow. I found this giveaway through my email. Ive been a follower for several years. Happy New Year! What is your favorite part of winter and where did you find this giveaway? I like that I can wear cute winter clothes and boots. My favorite part of winter is getting warm under the blankets and I found this giveaway from a giveaway hop. My favorite part of winter is usually the holidays that happen during that time of the year!! I dont like anything about winter. I would love to be outside enjoying the sunshine. Not very fond of winter very much. The days are getting longer now. i found this giveaway through the kids did it. i like the holidays but not much else about winter. I like the holidays and the good food :D I found it on a blog I followed. I found this giveaway on the giveaway hop! This winter, my favorite part was the snow we got a few days ago! It hasn't completely melted yet! Most winters, my favorite part is hoodies and hot chocolate! I like winter is because holidays as my kids love Christmas. I found your giveaway from twitter. I like the Snow! I found this giveaway through another blog. My favorite part of winter is when it's over! I found the giveaway at Online-Sweepstakes.com. I love it only during the holidays and then mind January I am tired of the ice and the snow, not to mention the cold. My favorite part of winter is we might get snow once a year. I found this giveaway via a link in the giveaway hop. My favorite part of winter are SNOW DAYS!!! I found this giveaway via a link in the giveaway hop. My favorite part of winter is watching the snow fall and building a snow man. I found this through a blog. My favorite part of winter is sharing the Christmas Holiday season with family and friends. I found the giveaway hop announced in several blog email newsletters that I subscribe to. the only part I like about winter is the holidays and that I get to spend much more time at home since the kids activities slow down. I found this on another blog with the hop posted. My favorite part of winter is egg nog, hot chocolate and pumpkin spice everything! I found this giveaway through the Jeepers! It's January giveaway hop via Savings in Seconds. I love all the bonfires we get to make.... I found it via a newsletter. I love the snow and cuddling up in front of the fireplace. I found the giveaway through a link from another blog in the hop. I love the colder weather and blanket snuggling. I found this giveaway on the blog hop. My favorite part of Winter is when it snows & playing outside with my kiddos! Found Your Giveaway on the Giveaway list posted on another blog. Thanks! The nice part of the winter is holidays and kids just love it. I like winter only because of the holidays. This is on momtograndma. My favorite part of winter is getting time off from work. I think I found this giveaway on giveaway junkie. My fav part of Winter is Christmas! I follow several of the blogs involved in the blog hop! The only part of winter I like is the holidays that we celebrate during the season. I found this giveaway following the hop. My favorite part of winter is Christmas time. I found this giveaway on the giveaway blog hop! My favorite part of winter is Christmas. I found this giveaway on your blog reading. I like the snow. I found this on a Online Sweeps. I like winter because it's not 110 degrees! I found your giveaway from another blog. I love the Winter days when we actually get snow, or when I can take the kids to the slope to go tubing. I found the giveaway from missmollysays.com. My favorite part of winter is Christmas. I found this giveaway on the Online Sweepstakes site. I like the winter for reading especially after the holidays because there is so much darkness, I need to consume my mind with some inspiration. I found this from the The Kids Did It blog. I don't love winter but my kids do especially snow! I found it via the hop! I like snow for Christmas but then I'm ok if it goes away. I live in ski country so we're stuck with it for like 4/5 months tho lol I found this giveaway while hopping along on the blog hop! I like winter for the holidays and the snowy weather, very cosy inside.